Voted the 'Best Airline in The World' for 13 years in a row on TripAdvisor, Emirates strives to continuously provide the best services on offer. Emirates is an environmental leader in the aviation and travel industries. Their goals are to make sustainability and eco- efficiency essential to all flight operations. 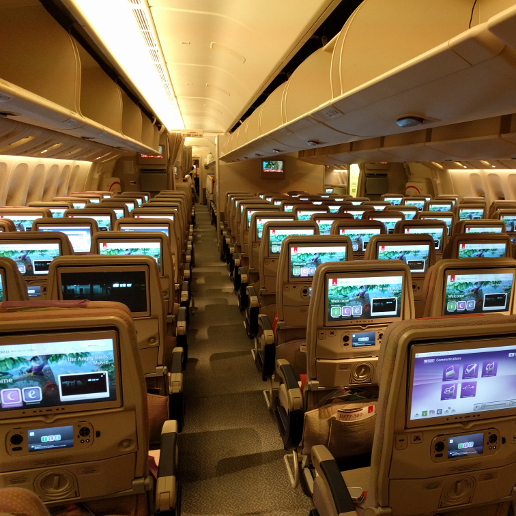 Emirates have been recognised for quality of their in-flight cuisine, the breadth of their in-flight entertainment, and the excellence of their overall service. In 1985, Emirates flew its first routes out of Dubai with just two aircrafts, with primary focus on providing world class customer service and quality. Emirates managed to evolve into a globally influential travel and tourism empire that is recognised globally. They are the world's biggest international carrier, the seventh largest airline in the world in terms of revenue, and the largest airline in the Middle-East in terms of revenue, fleet size, and passengers carried. Emirates has been recognised many times over the years for their quality services, but they do not just want to be remembered as that as the company is constantly improving their services to be the best. Each award drives them to develop even better products and services, and they should certainly be proud of their reputation for overall excellence among global travellers. Emirates is an airline that recognizes your travelling needs and goes over-and-above to ensure that your travelling experience is of impeccable standards. 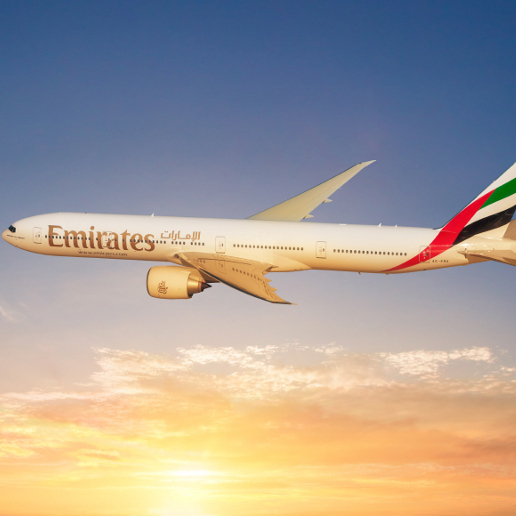 Book Emirates flights to Dubai, London, Copenhagen and other exciting places! Emirates is known as one of the airlines that offer the world's most generous baggage policies. All passengers are allowed 1 piece of hand-luggage (7kg) in the cabin. Baggage allowances may vary depending on the distance of your flying journey therefore, passengers are required to find out these allowances before they leave for the airport. You can check in as many pieces of baggage as you need, as long as the total weight is less than the maximum baggage allowance of your class. Passengers departing from Africa are allowed two bags of up to 23kg each in Economy Class and two bags of up to 32kg each in First or Business Class. Should you exceed the free baggage allowance, normal excess charges apply. The amount of hand luggage may vary depending on which cabin class you are flying. First class and business class passengers are permitted 2 carry-on pieces of baggage; one briefcase plus either one handbag or one garment bag. Economy class passengers are permitted one piece of carry-on baggage. Passengers are allowed to check in online and save time at the airport. Passengers may also choose their seats, 48 hours before their flight departs, at no extra cost. 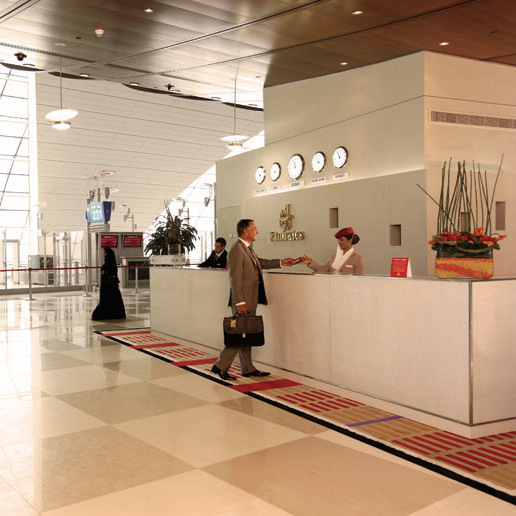 Emirates online check-in is made available 48 hours before your flight departs. Passengers are requested to arrive at the airport no later than 3 hours before departure. Passengers are also advised to go through security no later than 60 minutes before departure. Boarding gates close 90 minutes before departure times. Fly first class and enjoy the luxury of your private suite, or take your taste buds on an adventure with the choice of fine dining on board. • Privacy doors at seat cubical, so you can have your own space. • Convert seat into a fully-flat bed. • Vanity table and mirror at seat cubical. • Over 2500 entertainment channels available to choose from. • On-board lounges on Emirates A380. • Gourmet meals and beverages served in-flight. Arrive at your destination relaxed when you fly Business Class offering unrivalled leg room, regionally inspired dishes and fine wines to indulge your senses. • Seat that can convert into a flat bed. • Personal mini-bar on Emirates A380. • Global cuisine and beverages. Enjoy up to 2500 Channels of entertainment, savour gourmet meals and stay connected with friends and family in the air when you fly Economy Class. • Over 2500 entertainment channels available. • Gourmet meals and beverages offered. • Entertainment for the kids is available in-flight. The Emirates flight schedule operates over 3000 flights in a week across its network of over 160 destinations, in over 70 countries, across 6 continents from their main hub in Dubai International Airport. Several destinations are added each year.